A recent article on Catholic Lane took up the question of whether widespread misuse of insurance was contributing to rising healthcare costs and in turn making healthcare less affordable. The point was made that when people are self-employed and purchase their own coverage, they usually opt to have only catastrophic coverage, reasoning that the cost of insurance is justified by the significant risk posed to them by low-probability, but serious, health events. However most employee plans cover events that are not catastrophic, but both foreseen and routine (high probability). A comparison with automobile collision insurance might help paint the picture. Collision coverage is for a catastrophic event. Since these events are rare, it is possible to spread the risk out over a population. People weigh their coverage options carefully to figure the least insurance they need, usually trying to balance the cost of the premiums against the risk of having to pay the deductible. Now imagine what would happen to collision insurance costs if suddenly tune-ups, batteries, alternators, tires, brake jobs, and oil changes were covered items. It is almost impossible to spread the risk of these events out over a population because they are routine events that every car owner is going to be faced with regularly. On top of that, once they were covered, so that the cost of them for the individual owner dropped significantly, people would demand more of them and in fact they would change their behavior. Guys who would otherwise have changed their own oil, done their own brake jobs, or replaced their own alternators would get them done at a shop instead because the cost-saving incentive to do it yourself would have evaporated. The increased demand would drive up the price of the services, putting them out of reach of drivers who did not carry collision insurance. At the same time, collision insurance premiums would soar to cover the new costs and because the personal economic benefit of having the insurance would appear all the greater. We would be hearing complaints about access to tires and brakes for some of the population. NPR would be doing a story about the family devastated economically when their only vehicle and way to work was wrecked after they dropped their unaffordable collision insurance. 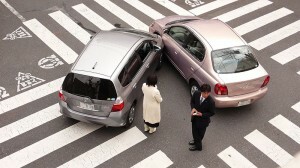 We would be hearing that employers should provide collision insurance for their workers’ cars. Right now, that is the state of medical coverage. Routine care is covered, but because just about everyone will need to visit the doctor once in a while for a minor illness, and because everyone should get a yearly check up, have routine medications monitored, etc., there is no way to spread the risk of these things out over a population. And the ready access to employer-subsidized insurance has changed behavior. For example, some of the young mothers that I know take their children to the doctor far more frequently than I ever took mine. I was seemingly of the last generation of American parents who figured that most childhood illnesses would simply pass in a few days. My generation figured that if you went to the doctor for a cold, it would get well in seven days, and if you just stayed home and rested, it would get well in a week. When my children were young, schools accepted a note from a parent that the child was home ill, instead of demanding a doctor’s note to excuse an absence. Employers now are the same way: since they have to pay for sick days, they insist that the employee present a doctor’s note. All this increased demand for routine medical services drives up their costs and that in turn drives up the cost of the insurance and the demand for it. Now there is some logic from the insurance company perspective, in the hope that covering routine care will prevent more catastrophic illness and ultimately save money. But the question of whether covering routine medical care under insurance will really create savings is no longer a matter of speculation. It simply hasn’t. What it has done is drive up costs through increased demand as well as by adding a layer of bureaucracy and paperwork to the once straight-forward system whereby you called the doctor and relayed your symptoms and if the doctor thought you should be seen you went in and paid a small out-of-pocket fee for the office visit. But what about the truly needy who would neglect to visit at all if there was not coverage? Been there. Been there when I had to arrange payments for an office visit. Been there when I had to ask a doctor personally if he could see me at a reduced fee. And guess what? He did. But how often do those kinds of conversations ever even happen anymore between doctors and patients? The previously mentioned article about insurance prompted one of Catholic Lane’s regular readers to comment that solidarity is the principle behind insurance. Certainly that is true – and it is a great truth. Mutual aid societies and brotherhoods go back hundreds and even thousands of years. When you know you can count on your community to make you whole or at least help you substantially recover from loss because everyone counts on everyone else, you have the most basic and ancient form of insurance. We often hear solidarity spoken of as a one way street. We are urged to have “solidarity with the poor” as though solidarity was something like charity that flowed from the more well off to the less well off. But solidarity does not work like that. Solidarity binds together the entire society in mutual obligations. All persons — regardless of their economic situation — have an obligation to the common good. Let’s go back to our analogy of the collision insurance for a moment. Does a poor person driving a beat up old Toyota have any less obligation to obey the traffic laws than a millionaire driving a Cadillac? No. They share the same road. They are under a mutual obligation to be careful of one another’s safety and the safety of all by keeping their vehicles in proper working order, operating them with caution, making sure their ability to drive is in no way impaired, and obeying all the traffic laws. Both are equally responsible for their own good and the good of all other drivers on the road. That is solidarity. Solidarity is as damaged if the Cadillac driver drives sleepy or neglects to get faulty brakes repaired as it is damaged if the Toyota driver runs stop lights or fails to fix a broken brake light. We expect the Toyota driver to be just as responsible for the cost of fixing his brake light as we expect the Cadillac driver to be for the cost of his brake job. If either one fails, this failure to personally take proper care of oneself and others is called a social sin because it affects the well-being of others. We don’t exempt the Toyota driver from responsibility to the common good because he is less wealthy than the Cadillac driver. Collision insurers attempt to penalize certain social sins by upping the premiums on drivers with a record of driving unsafely. The entire structure of traffic laws, police enforcement, and insurance works together to reinforce that behavior which most contributes to the common good of all drivers. It assumes, and in fact depends on, the personal responsibility of all. And we don’t have any qualms about expecting people to spend money to meet that obligation. Their own money. If I turn into a pole and smash the headlight on my van, I don’t have any legal or financial mechanism to make you pay to repair it and if I don’t get it repaired and end up with a traffic ticket, I don’t have any way to make you pay that either. When it comes to healthcare though, we exempt large portions of the population from personal responsibility for decisions that injure solidarity. The same person we expect to buy his own alternator, we feel we can’t expect to pay for his own yearly physical. The same person we expect to pay for an oil change, we feel we can’t expect to pay for a routine office visit to the doctor. The same person we expect to handle the expense of new tires, we feel we can’t expect to pay for his children’s vaccinations. The concept that routine medical care should just “be there” and be free or nearly free has so infected our society that medical care keeps getting less and less affordable and less and less accessible. At the same time, our system faces ever more costs for care from bad personal decisions. At least everyone fears getting in a car accident because they know they can be badly hurt. Even if you have a low-deductible collision policy, you are going to do your best to avoid an accident and keep the insurance company from having to pay. But people engage in health-damaging behaviors with abandon, because they are able to make others bear the costs. The individual cost-saving benefit of proper attention to one’s own health has evaporated. But the virtue of true solidarity should make us determined to care responsibly for our health so as not to burden others unnecessarily. To fail to care for your health then is a social sin. To run to the doctor for every little thing, just because you have insurance, is also a social sin. The virtue of true solidarity would allow a doctor to make separate payment arrangements with some patients and the virtue of solidarity would make them honor those arrangements. The healthcare solution America really needs is to be found through practice of the virtue of solidarity.